Did Ryan Leaf sabotage the 1998 NFL Draft? 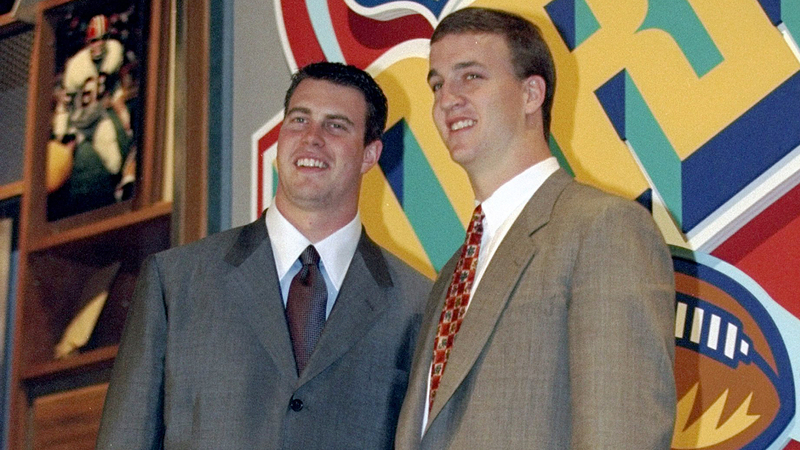 Remember all the talk before the 1998 NFL Draft about which QB, Peyton Manning or Ryan Leaf, should be selected No. 1 by the Indianapolis Colts? The Colts ended up taking Manning, of course, which led to many great seasons and a Super Bowl title. The Chargers scooped up Leaf with the No. 2 pick and, well, it didn’t go so well for them. It was not until several months before the draft that I realized Ryan might present challenges I didn’t anticipate. By then, it was too late. "No way do I want to play in Indianapolis," he told me, referring to the Colts, who owned the No. 1 pick. Instead, because of the exceptional weather and the more laid-back lifestyle, he preferred the San Diego Chargers, who would go second. "That’s fine," I warned him, "but the way to achieve this is not exactly going to help your image. You’ll get a lot of criticism." Ryan didn’t care about his image, though, only his destination. I told Ryan it would do no good to approach Colts GM Jim Irsay. Irsay saw the sport the same way he viewed his other passion, rock ‘n’ roll. Just as musicians tended to be a bit eccentric, so did football players, and that did not stop him from drafting Jeff George or trading for Eric Dickerson. "Leigh," he used to say, "it’s about the freaking talent." If someone is that gifted, in Irsay’s opinion, you simply find a way to deal with his personality. Instead, the case needed to be made to the Indianapolis coach, Jim Mora, and it couldn’t come from anything Ryan said. It had to come from what he did, or, rather, did not do. "If you go to the combine," I told Ryan, "but fail to show up for a meeting with Mora, that should do it. Jim is a real prideful person who has a tendency to explode. I am not recommending you do this, but if you are desperate to go to San Diego, this is the way." Steinberg, who was the inspiration for the Tom Cruise’s character in the movie "Jerry Maguire," says that he cleared the plan with Bobby Beathard, the San Diego Chargers GM at the time. Leaf skipped the interview with Mora at the combine and the rest is history. Once Ryan was a no-show, Mora, as anticipated, went ballistic. I defended my player, naturally, dismissing the coach’s response as another Mora meltdown. As I’d anticipated, Ryan was criticized, but the plan achieved its purpose. The Colts took Manning. Something tells me the folks in Indianapolis have never regretted that decision. Polian did confirm that Leaf missed the meeting with Mora at the combine. Beathard, meanwhile, said Tuesday that he didn’t recall much from the story. As a human who got a to play with Peyton Manning.. I'd like to take this tweet to thank Ryan Leaf and his suit for "tricking" Mr Polian.